The polycarbonate model with two shell sizes. Excellence helmet for long distance riders. 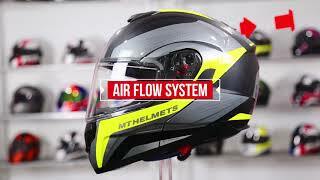 Vents and spoiler for great ventilation In any helmet position on the bike. Visor with lock system mechanism. Anti-scratch visor with fast removing system. Includes pinlock original system to ensure maximum fitting. Improved 100% Max Vision Pinlock ready and sun visor. Inner linning anatomical for a better commodity and comfort and washable.